HomeGold IRA BlogBuy GoldMarket Bulls are Loose in the China Shop! 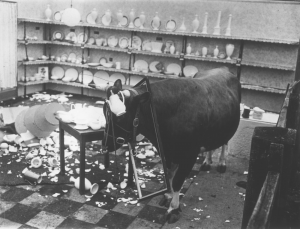 Market Bulls are Loose in the China Shop! Market ether has finally evaporated and those die-hard bulls who have refused to give up on the last possible 10% gain from this market, may soon find themselves in a position to lose 50% of their portfolio in the blink of an eye. Today’s headlines are full of ‘reasons’ for the coming market drop. Billionaire investor Jim Mellon today pointed to the buyback craze I’ve been warning of since this time last year. He said, “There has been far too much complacency, far too many buybacks by corporations of their stock which have supported the market, far too much concentration of ownership, particularly in tech stocks in the U.S. And it’s time for a very major correction, which is I think what we’re embarking on.” He goes on to reinforce my warning that the market is more overvalued than any time in its history, identifying 1929, 2000, and 2007 as lesser examples. Global conflicts, increasing refugees, and ongoing stratification of monetary unions have market pressures at a high. And while all of this market carnage is occurring, physical precious metals investors are breathing easy, realizing that they have the world’s potentially greatest asset protection in their corner. As the U.S. stock market continues to diesel and chug, having already given up the year’s gains, but still within reach of its all-time high, gold finds itself comfortably sitting more than 40% below its high and silver, more than 85% below its high. The opportunity has never been greater and the need is becoming more immediate and intense daily. You’ve got medical insurance to protect your family’s health. You’ve got homeowners insurance to protect your home and visitors. Why in the world would you be willing to go for a ride on the global financial highway without insurance? Call American Bullion at (800) 653-4653 to speak with a knowledgeable representative, who can help you to insure your financial future and legacy. The writing is on the wall. The next warning you hear may be too late. And today’s prices make the decision a true no-brainier. Call American Bullion now and don’t get caught without a chair when the music stops!